First of all sorry for the lack of new posts over the last few days but I have been having technical problems. You may have seen a few testing posts over the last day or so as I tried to fix things. Now armed with a new editor I am back in business so things should get back to normal just in time for the Christmas break! There may be one or two formatting issues as I get used to the new editor and even more spelling mistakes than normal as there is no spell checker available yet! It has to be said that so far the Stagecoach takeover has been a bit of a damp squid with a fleet of elderly Tridents running around on a much reduced network. The Tridents are all in full Stagecoach livery and there are a few newer Enviros so its still an improvement on the old First fleet but its the coming months when we get to see what Stagecoach are bringing to Plymouth that we will really see what Stagecoach can do that First never managed. Seen heading Southbound on the M5 at Sampford Peverell yesterday morning was 10452 - SN65NZJ, an Alexander Dennis Enviro 400MMC which is destined for the Stagecoach South West fleet, for use on the Red (Honiton Road) Park & Ride. Meanwhile the new Megabus fleet due to operate out of Plymouth has also started to arrive with 54264- 69 YY65VXF/G/H/J/K/L Volvo B11RT Plaxton Elite Interdeck coaches already noted. Some of these may still be operating out of Rugby at the moment but carry DC Devon legal lettering so will join the local fleet. Not sure how many of these are due? Sorry Graham but your fleetnumbers are confused. 10452-6 are for Exeter and it's reported elsewhere that 10457-62 are being diverted to Plymouth (they were ordered for Manchester), so presumably for the P&R 100/101. Whether Manchester will get some of the 10488-503 batch in due course as replacements remains to be seen but it would seem reasonable. Indeed, time will tell. It would seem that Stagecoach is juggling a few things around, which might suggest that they have a specific date to give First their buses back and if (I do say 'if') ADL's schedule has slipped a little then it might explain the confusion i.e. they're having to delay some of the Manchester batch to allow Plymouth to jump the queue. Having Christmas and New Year, with the need to prepare the buses for service and no doubt vinyl them up and do driver training, it's probably all got a bit tight. Originally there was 31 E400s due for Manchester between the Exeter and Plymouth deliveries - too many for the timescale I guess, especially if ADL is having a Christmas shutdown. Hi, I was under the Impression that when Plymouth Get there New Buses in January there were 21 Double Deckers and 5 Single Deckers 10488-10503 is 16, maybe I'm wrong but thought the Order was enough to Cover The Park and Ride,1 /X1 To Tavistock and the 3 service Between Plymouth and Dartmouth. The original vehicles planned for Plymouth were 16 Double Deckers 10488 - 10503, 5 single deckers 26034-8 and 8 new Plaxton Elite coaches 55031-8 in Stagecoach Express livery. 55*** are LHD vehicles, so that can't be correct. I would be very surprised if more local bus services are planned but then such info would be commercially sensitive even within the Company, so you wouldn't expect her to say anything else until registrations were public, at least. There's been lots of confusion and/or misinformation about coach work - still is - and whether there are plans for both Megabus work and Stagecoach Express work. Obviously the former has happened and there's no reason that more Megabus work couldn't be added going forward as long as there's sufficient workings to diagram the coaches to Plymouth for servicing. Rugby is at capacity (don't know about Cwmbran but I would guess so), so if Megabus is to keep expanding they need depots to carry out coach maintenance and Plymouth is the obvious candidate right now. I assume that Stagecoach Express work would need to be registered and nothing's come through VOSA as yet, so if it was to happen, you'd be talking end of February at the earliest. Finally (unless VOSA's wesite is still to be updated), surely they need to apply for an increased authorisation at The Ride to accommodate more work? It still shows a maximum of 42 vehicles and I'd have thought that the new Megabus work would taken them up to that, if not beyond it, even allowing for Dartmouth's and Tavistock's allocations. I am sure Stagecoach will have some ideas for expansion in 2016 within Plymouth area, but there is no way they will admit it. I remember years ago I contacted First to ask if it were possible to expand routes in Plymouth, got the same response as you..less than 6 months later they started in Southway, plympton, ernesettle and estovwr! No, of course they wouldn't admit it and while I have no doubts that they'll be looking for any additional opportunities in the Plymouth area, just as they do in Exeter, Torquay or North Devon, they're not going to potentially destabalise what they already have in Plymouth by launchng risky competition with Citybus. They'd need to substantially grow the market for it to work, not take-on additional costs and have revenue on existing routes be split with Citybus, who'd be bound to retaliate in some form. It's not worked in previous bus wars in the City and wouldn't work in another one. No, expansion will come by slowly plugging away at what they have and by other means. Cwmbran is at capacity doing all the work for Brynmawr which is its outstation .Brynmawr is only for fuelling and washing.The dead mileage on the X3/X4 was costing a fortune.Plymouth will take all the Megabus work inhouse from Hamilton Gray. Megabus should mostly now consist of B11 Elite Interdecks and certain workings will still have Van Hool double deckers. Brand new Interdecks to come for the Express airport work too. There were two of the new red E400 MMCs parked behind the Stagecoach garage in Exeter yesterday afternoon. Also present was MAN/E300 24144 painted all over blue (a similar shade to that used by Cardiff Bus). Could it be that the Exeter P&R is to have a rebrand? 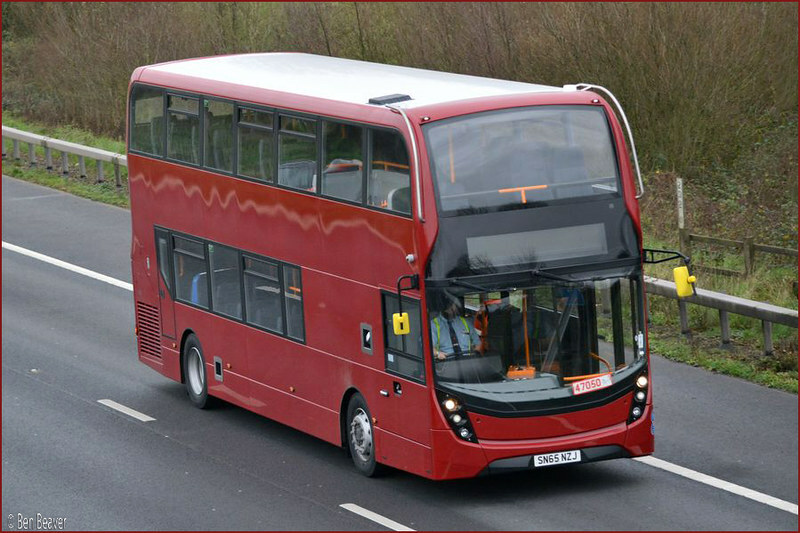 Having red buses on the Red route would be better than the present buses which are mostly yellow. One of the MCV Darts was parked nearby.